Here are some more foreign release ads for James Whale’s Bride of Frankenstein (1935). 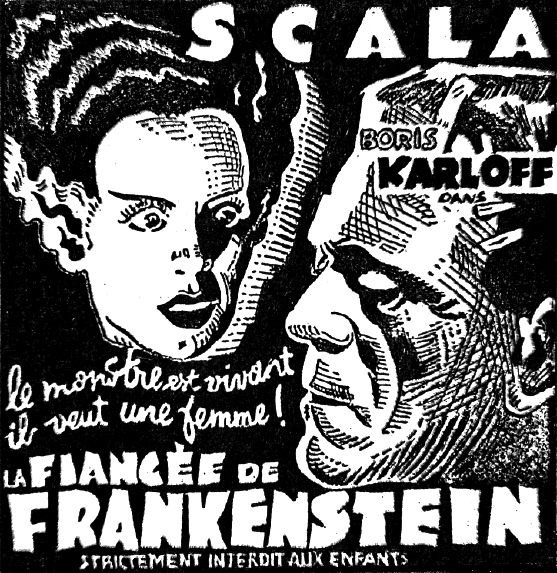 These ads mats, in stark scratchboard black and white, advertised La Fiancée de Frankenstein in French newspapers. 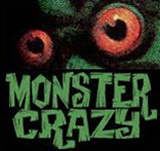 The Monster is prominently featured here, he’s obviously the bankable star of the picture, but The Bride also appears and was used on most of the film’s promotional material, in America and elsewhere. There seemed to be no attempt to tantalize patrons and keep them guessing as to The Bride’s appearance. Mind you, even after seventy-three years of exposure, as celebrated and iconic as The Bride’s exploding hair profile has become, we still get a shudder and a thrill when she first steps out of her mummy bandages and cranks her Nefertiti head around in staccato poses. The ads for La Scala read: “The Monster is alive! He talks! 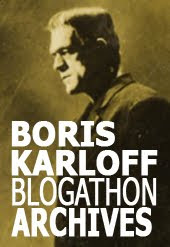 He demands a mate!”, and warn that “Children are strictly forbidden”. The banner ad for the Saint Severin, of more recent vintage, pronounces the film as “The Masterpiece of the Fantastic!”. I previously posted a 1946 French movie poster for the film here. With thanks, encore et toujours, to Jean-Claude Michel for the images. i like frankenstein waving goodbye in that last one!